Our Seebald and Associates team are experts in all facets of Safety of Life at Sea (SOLAS) and the Maritime Transportation Security Act (MTSA) as they relate to regulated facilities. We offer a suite of services including training, critical analysis, technological support and cyber security. Seebald and Associates offers all aspects of training required under 33CFR105. Our Maritime Administration (MARAD) certified and Coast Guard approved training courses are held in locations all across the country. Additionally, companies may request private courses for their staff, on-site or at a location of their choosing. Please contact us for more information on scheduling a private course for your organization. This is a highly interactive 20-hour course to educate FSOs on pertinent laws, regulations and policy, including additional modules on current threats. The course covers all of the required elements found in 33CFR105. Additionally, the course is rich in resources that participants can take away and use as “ready references” when they return to their facilities. Seebald and Associates also offers all students one year of continuing education through webinars specific to facility security. This course is Maritime Administration (MARAD) Certified and Coast Guard Accepted. This highly interactive 9-hour course provides a tremendous amount of practical applications. The course covers all of the required elements found in 33CFR105. This course is rich in resources that participants can take away as references, and offers continuing education through webinars specific to facility security. This course is Maritime Administration (MARAD) Certified and Coast Guard Accepted. This course covers the six required elements found in 33CFR105 for employees who are neither the FSO nor Security Personnel with Specific Security Duties that work on a regulated facility. We typically refer to these employees as “All Others." In addition to employees, the course is also valuable for any long-term contractors, and contractors who will work unescorted on the regulated facility. Seebald and Associates' extensive process for conducting Facility Security Assessment assists our clients in identifying weaknesses and vulnerabilities and developing potential strategies for mitigation. 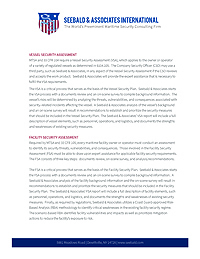 The Assessment provides the basis for building a comprehensive Facility Security Plan that is designed to exceed Coast Guard regulatory requirements. The FSPs are designed to be a working resource for the Facility Security Officer. As a direct result of our extensive Coast Guard experience, Seebald and Associates Facility Security Plans are highly regarded by the United States Coast Guard. As part of the FSA and FSP process, Seebald and Associates provides ongoing support and consulting for one year following approval of your FSP. Seebald and Associates provides Facility Security Audit services to all regulated facilities as required annually by 33CFR105. Seebald and Associates audits cover all regulatory requirements. We begin by conducting a complete FSP review, an on-site physical audit, an annual exercise, a required drill, and Security Awareness training as needed. An extensive follow-up report completes this in-depth process. Seebald and Associates Architects are certified Facility Security Officers who work in partnership with regulated facilities to develop premiere environmental designs with the highest level of security in mind. Our services include Crime Prevention through Environmental Design, structural design and placement, perimeter fencing, access control points, traffic flow management, and security operations support structures, such as operations centers and canine facilities. Our phased approach to implementation minimizes the impact on current operations and ensures all risk mitigation measures are in compliance with Department of Homeland Security and Unites States Coast Guard regulations. The Seebald and Associates Cyber Security Health Check provides critical insight into potential vulnerabilities in your IT environment, and assists in implementing defensive strategies that will prevent possible disruptions to your IT systems or the disclosure of sensitive information. Click the image to download a detailed PDF of the products and services offered by Seebald & Associates! I must say that this has been one of the most comprehensive Facility Security Plans that I have reviewed during my tenure as a Facility Inspector.